With its fine foods and sumptuous wines, golf courses, stunning coastline, wonderful accommodation, arts and culture, the Mornington Peninsula is certainly a number one holiday destination. Located along the southern coastline of Victoria just an hour from Melbourne, the Mornington Peninsula is a place where you will find secluded bays, waterfront restaurants, lazy beachside holidays or ideal escapes to the countryside surrounded by wineries and vineyards. Delight in an array of water sports from world class fishing, scuba diving, snorkelling and surfing or perhaps a day on the green with breathtaking views of the Southern Ocean capped off with a meal and drinks with friends in the stylish club house sounds like you. From championship golf courses, art galleries, grand historic mansions perched high on cliff tops, spa retreats and plenty of outdoor fun and entertainment, the Mornington Peninsula is a holiday destination jam packed full of plenty to see and do. Whatever your interests, taste and type of holiday you are after you will find so many things to fill up your days with when enjoying the Mornington Peninsula! Base yourself in one of the quiet coastal towns and villages and have a holiday unlike any other before or plan a touring holiday to take in all of the attractions and experience the many activities you can do while you are here. Treat yourself to a pampering session in a well being day spa, dine in fine dining restaurants with magnificent views to cap off a perfect meal, take the kids exploring through stunning wildernesses and National Parks or join a food and wine tour to taste the delights of the region. There are family resorts, exclusive retreats, honeymoon suites, sailing cruises, holiday homes, B&B’s and intimate guest houses that can all be booked at various locations throughout the Mornington Peninsula that are all surrounded by sights and delights that everyone will love. Walk through lavish parks and gardens, visit over 50 cellar doors, explore the numerous coastal walks and hiking trails or walk along printless beaches where you will feel like you are the only ones around for miles. Come face to face with an array of wildlife from seals to birds and dolphins through to passing whale during migrating season! The Mornington Peninsula is a holiday destination that will capture your heart and will leave a lasting impression on you with beauty and rugged landscape that boasts hidden treasures and numerous delights. Plan the perfect honeymoon, indulge yourself for the weekend or bring the kids for a holiday they will never forget as you explore the beaches, wander through interesting towns and villages, sail the coastline, view the wildlife or base your holiday around one of the annual events that the Mornington Peninsula is famous for such as food and wine festivals, surfing carnivals, golfing tournaments, arts shows and many more. You can swim with dolphins, have a camping holiday in paradise, go horseback riding along the beach, stay in five star accommodation or even enjoy the many free attractions that dot their way through the region. 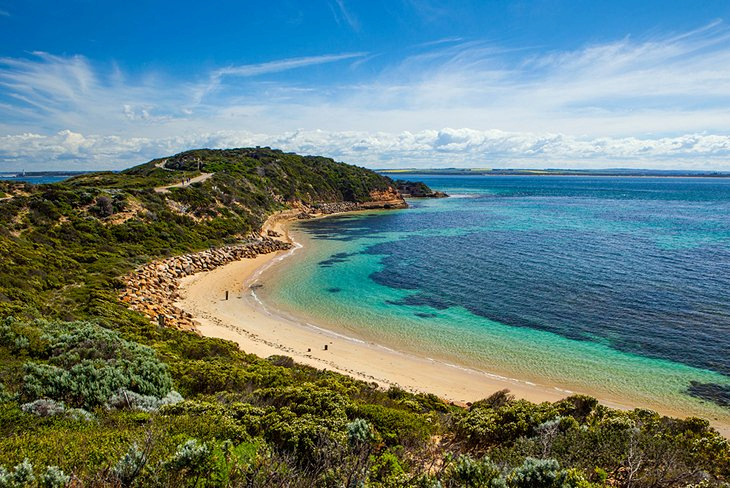 It doesn’t matter if you only have a few days or perhaps are planning an extended holiday, the Mornington Peninsula is a holiday destination where you will not be disappointed!